Are you looking for reliable chronic pain relief in Central Wisconsin? By utilizing the latest in technology, along with decades of experience and unparalleled knowledge about treatments and techniques, our Mosinee pain relief clinic is well-equipped to handle many chronic pain conditions . At the forefront of our chronic pain treatment approach is High Intensity Laser Therapy, a method which was co-developed by our own Dr. Curt Draeger. Using the knowledge, resources, and technology at our disposal, we are now able to provide this innovative chronic pain relief treatment to patients in Mosinee. But what can you expect from High Intensity Laser Therapy? 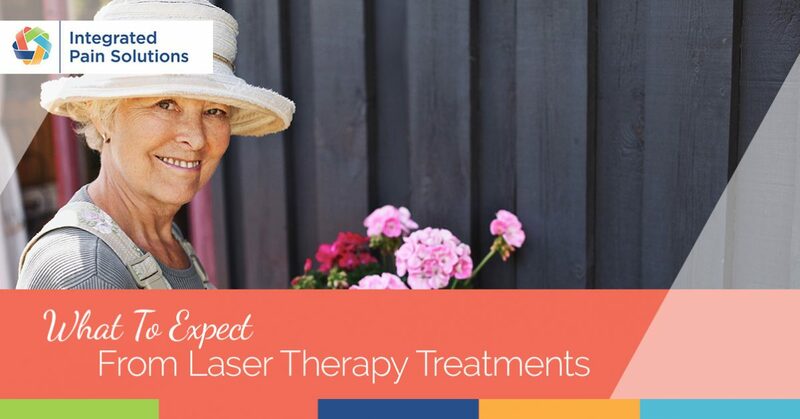 In this blog, we’ll be going over some of the basics on what to expect along with some of the key benefits of laser therapy so that you can be better informed and better equipped prior to your first treatment. Ready to schedule a no-cost consultation? Contact Integrated Pain Solutions in Mosinee today. First of all, it’s important that we get started by helping you to understanding what exactly we mean by High Intensity Laser Therapy. Don’t get fooled by the “high intensity” part of the name — this is actually a non-invasive, completely safe, and virtually pain-free treatment designed to provide lasting chronic pain relief. High Intensity Laser Therapy gets its name from the lasers that are used in the treatment, which are designed to deliver light energy to the body’s cells (which then convert that light energy into chemical energy, which fuels cell growth and healing). It’s important to know that not all “high intensity” lasers are created equally. The lasers used in our clinic are 10 to 100’s of time more powerful than other lasers, reaching deeper into the cells of the body. This, combined with our understanding of chronic pain and progressive, manual therapies provide better outcomes and longer-lasting results for many of our patients. If you are currently suffering from one or more of these chronic pain conditions, then High Intensity Laser Therapy just might be right for you. Whether you are looking for a different approach from the outset, or you’re tired of going through the ringer with multiple doctors, surgeries, pills and injections, contact our Mosinee pain relief clinic to find out if you can benefit from HILT. High Intensity Laser Therapy is a different treatment approach because it is non-invasive, it’s drug-free, and it’s safe. This treatment method has been cleared by the FDA and trusted by world-class athletes and chronic pain sufferers alike for several decades. When implemented by a trained medical professional, there are no known side effects during or after High Intensity Laser Therapy treatment. Most patients describe High Intensity Laser Therapy to be relaxing and therapeutic. That’s because the lasers themselves emit a warm, penetrating light which tends to be soothing to many patients. It is certainly not painful or invasive, which is one of the biggest advantages you can find from a chronic pain relief treatment. While High Intensity Laser Therapy is not a “one-off” treatment, some patients do say that they can feel its effects in as little as one treatment. However, in order to receive maximum benefit patients are scheduled for a series of treatments. Tissue Repair: The light energy from the lasers penetrates through bone, tissue, and cells in order to promote DNA and RNA repairs within the cells themselves. That means that damaged muscles, nerves, and ligaments, and other areas are healed faster. Soften Scar Tissue: This is one of the biggest benefits of High Intensity Laser Therapy. Scar tissue is one of the biggest sources of chronic pain, largely because it is significantly weaker and more sensitive to pain. Laser therapy can soften this scar tissue to make it less prone to pain and more flexible. Reduce Swelling: High Intensity Laser Therapy treatments also have anti-inflammatory effects because of their ability to promote the expansion of blood vessels. This also promotes and improves blood flow and allows the body to deliver more oxygen and vital nutrients to the affected area, thus promoting healing. Pain Relief: Laser therapy increases the production of natural pain-killing endorphins and enkephalins while also resetting the chronic pain cycle. So, now that you know what to expect from High Intensity Laser Therapy, are you ready to discover a new approach to chronic pain relief? Contact Integrated Pain Solutions in Mosinee today to schedule a no-cost, no-obligation consultation. *Disclaimer: Testimonials are based on personal experiences from actual patients. Individual results depend on many factors and may vary from patient to patient. Integrated Pain Solutions cannot guarantee the outcome of any individual’s treatment.